2 EARTH DAYS AGO ANOTHER HUGE FLEET OF LIGHTWEIGHT PLEIADIAN RAINBOW PLASMA SHIPS CAME THROUGH THE SOLAR PORTAL AND ARE NOW DOCKED AROUND EARTH’S SUN. THERE IS A TOTAL OF APPROX 500,000 OF THESE BENEVOLENT HIGH-VIBRATIONAL PLASMA SHIPS HERE IN OUR SOLAR SYSTEM CURRENTLY. THESE HEAVENLY SHIPS ARE BEING PHOTOGRAPHED AND FILMED ALL AROUND THE WORLD EVERY DAY NOW! ITS IMPORTANT TO NOTE THAT THESE SPECIFIC LIGHT SHIPS ARE VERY POWERFUL BENEVOLENT LOVING LIVING ENTITIES KNOWN AS ANGELS OR EXTRATERRESTRIALS. THESE BEINGS ARE COMPRISE THE GALACTIC FEDERATION OF WORLDS WHICH IS LOCATED IN THE FIFTH DIMENSION AROUND CERTAIN STAR CLUSTERS. THE PLEIADIANS AND 3 OTHER MAIN STAR RACES ARE HERE LEADING THE WAY TO ASSIST HUMANITY IN THEIR GRAND EVOLUTION! THE PLEIADIAN SHIPS HAVE BEEN COMING IN THROUGH THE SOLAR PORTAL SINCE 9-11, 2018 AND ARE POSITIONING FOR THE GRAND FINALLY OF THIS ASCENSION! IN MOST CASES THESE CELESTIAL LIGHT-BODY SHIPS APPEAR AS TRANSLUCENT RAINBOW- COLORED CLOUDS…. IT IS POSSIBLE TO PHOTOGRAPH OR FILM THESE SHIPS IF CONDITIONS AND LIGHTING ARE CORRECT AND IF YOUR VIBRATION IS HIGH ENOUGH! THESE SHIPS ARE NO LONGER CLOAKED BUT SIMPLY RESONATE IN A HIGHER, LIGHTER FREQUENCY AROUND 40-100 HERTZ. WHY ARE THESE PLEIADIAN RAINBOW LIGHT-BODY SHIPS HERE? TO KEEP RAISING THE VIBRATION OF THE STARSEEDS HERE TO THE FIFTH DIMENSION. MANY ASK US WHEN WILL 5D COME TO EARTH? MANY STARSEEDS STATIONED ON EARTH ARE ALREADY MOVING FULLY INTO 5D NOW! THE ONE WHO CHANNELS THIS DATA CERTAINLY RESONATES AT THIS 5D LEVEL NOW AND CAN TELL YOU FIRST HAND ABOUT THE EXPERIENCE AND HOW IT ALL WORKS! WE AS THE PLEIADIANS HAVE DEPLOYED MANY TEACHERS AND HEALERS ONTO THE EARTH NOW AND WE ARE WORKING THROUGH THEM TO MAKE ALL OF THIS MAGIC HAPPEN! WE MUST NOTE HERE AGAIN THAT IT IS IMPOSSIBLE FOR AN UNCONSCIOUS HUMAN TO DECODE THE LIGHT-DATA WE BRING! TRYING TO LOOK AT ALL THIS FROM A 3D POINT OF VIEW CAUSES QUITE A RIFT! IT JUST ISN’T POSSIBLE! 3D AND 5D HAVE NOTHING TO DO WITH EACH OTHER IN ANY WAY AND ARE TWO COMPLETELY DIFFERENT REALITIES! THE LAWS THAT GOVERN 3D DO NOT APPLY IN 5D AND 5D LAWS OVER RIDE ALL 3D LAWS! EVEN IN UPPER 4D STILL THERE IS MUCH CONFUSION ABOUT HOW THIS 5D TRANSITION WORKS! ON THIS DAY WE CAME TO SPEAK DOWN-TO-EARTH AND CLEAR IT ALL UP! THE LABELS 5D, HEAVEN, GAMMA STATE OF CONSCIOUSNESS 40-100 HERTZ SCHUMANN RESONANCE, BLISS, LOVE ALL MEAN THE SAME EXACT THING! YOUR BODY HAS 12 PRIMARY STRANDS OF DNA WHICH WORK LIKE A FIBER-OPTIC CABLE AND 12 MULTIDIMENSIONAL CHAKRA PORTALS THAT ALLOWS ASKASHIC LIGHT-DATA TO COME INTO THE BODY. YOUR STORE THIS ADVANCED DATA IN YOUR CRYSTAL CELL DATABASE AND TRANSMIT IT BACK OUT AGAIN BY VIRTUE OF YOUR FREQUENCY. THIS TRANSMISSION BROADCASTS OUT OF YOU TO THE ENDS OF THE UNIVERSE OF WHICH THERE IS NO END! YOUR DATA BROADCAST CHANGES THE ENERGY OF EVERYTHING IT TOUCHES AND MOLDS THE MATTER OF THE UNIVERSE INTO SOLID ENERGETIC FORM! 10 OF THESE BODY DNA STRANDS WERE DEACTIVATED EONS AGO (BY NEFARIOUS BEINGS) FOR MOST HUMANS AND THIS IS STILL THE CURRENT STATE FOR ALMOST ALL HUMANS. 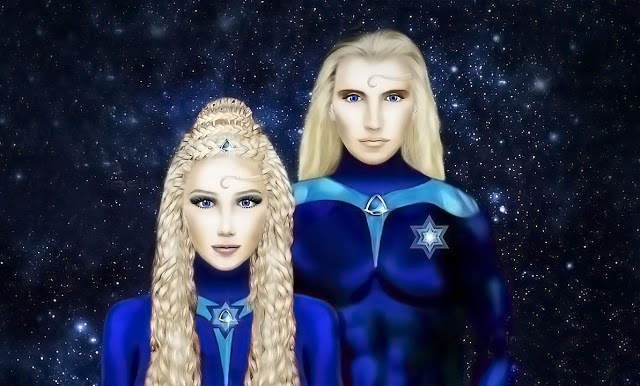 THERE ARE APPROX 4.5 BILLION STARSEEDS OF THE ANGELIC SPECIES, STATIONED ON EARTH NOW HERE TO WAKE UP HUMANITY! THOUGH 5D IS NOT A PLACE, THIS ENERGETIC STATE INSIDE OF YOU CAN AND WILL MANIFEST OUTWARDLY AS YOUR PHYSICAL EXTERNALLY PERCEIVED WORLD OR REALITY! THIS IS BECAUSE YOU ARE ALWAYS MANIFESTING YOUR PHYSICAL REALITY 100% BY VIRTUE OF THE SUM-TOTAL VIBRATION OF YOUR BEING. IN CONTRAST, IF YOUR INTERNAL VIBRATION IS RESONATING LOW ENOUGH YOU WILL MANIFEST A HELL JUST A SURELY! THIS IS JUST THE WAY THIS UNIVERSE WORKS AND ONCE YOU GET THE HANG OF THIS GOD-POWER AND WILL BEGIN TO CONSCIOUSLY MANIFEST WITH POSITIVE HIGH-VIBE INTENT AND THEN, UN-BELIEVABLE MAGIC STARTS TO HAPPEN ALL AROUND YOU! HE SAID “YOU JUST CANT SEE IT YET”, MEANING YOU ARE NOT RESONATING WITH IT OR YOU ARE NOT ON THE SAME ENERGETIC WAVE-LENGTH! IF 5D HEAVEN WAS HERE THEN, IT IS STILL HERE NOW! IT ALWAYS HAS BEEN INSIDE OF YOU WAITING BE MADE MANIFEST! UNTIL NOW ALL THE HOARDS OF HELL HAVE HELD U BACK FROM THIS BUT NOW A WAY HAS BEEN MADE BY THESE ANGELIC HELPERS AND YOU HAVE BEGUN TO BREAK THROUGH INTO THIS BEAUTIFUL DIMENSION. IT COMES FIRST INSIDE OF YOU AS AN AMAZING FEELING OF BLISS AND KNOWING! IT THEN COMES OUTWARDLY IN YOUR EVERYDAY LIFE! YOU CANNOT SEE THIS KINGDOM UNTIL YOU ARE FULLY HEALED DEAR ONES! SOMETIMES WE THINK WE ARE HEALED BUT IF ANOTHER BEING COMES CLOSE TO YOU WHO HAS POWERFUL 5D LOVE, IT WILL SURELY BRING THIS OLD ENERGY UP FAST! THIS IS HOW THE TWIN FLAME DYNAMIC WORKS! YOU WILL START TO JUST BE IN 5D WHEN U RESONATE WITH IT AND THERE IS NOTHING MORE COMPLICATED ABOUT IT! IF YOU ARE NOT EXPERIENCING THIS EVEN IN A SMALL WAY THEN THERE IS MORE INNER WORK FOR YOU TO DO! WE ARE HERE EN-MASSE TO HELP ALL WE CAN BY SENDING POWERFUL GAMMA LIGHT TO THE EARTH BUT YOU MUST DO YOUR PART! YOUR PART IS TO CLEAR OUT ALL LOW-VIBRATIONAL ENERGIES FROM YOUR BEING AND DO ALL YOU CAN DO TO VIBRATE SUPER HIGH! YOU MUST START LIVING AS A STAR-BEING ON EARTH! YOU JUST CAN’T LIVE LIKE A 3D HUMAN ALL DAY AND EXPECT ANY OF THIS TO BE A REALITY FOR YOU! YOU MUST BEGIN LOVING YOURSELF FIRST! THIS IS THE MAIN PROBLEM! WHY ARE YOU DOING SO MANY THINGS THAT U DO NOT WISH TO DO AND WHY ARE YO NOT DOING WHAT YOU DREAM OF AND LOVE? THIS IS WHERE YOU JUST BEGIN! WHY ARE YOU IN RELATIONSHIPS THAT ARE NOT LOVE AT ALL? WHY HAVE YOU NOT BEGUN TO HEAL YOUR INNER BEING? WHY DO YOU STILL BELIEVE ALL THE NONSENSE FROM 3D BECAUSE IT DOES NOT SERVE YOU! IT IS TIME TO START BEING THE HIGHER BEING THAT YOU ARE! DON’T BE AFRAID, START TODAY! TAKE A LEAP AND BEGIN! ALL THOSE LOW-VIBE THINGS WILL ABSOLUTELY FALL AWAY FROM YOU BUT KEEP GOING AND TRUST NO MATTER WHAT! THIS IS THE ASCENSION DEAR ONE! YOU CANNOT HAVE THIS HEAVEN UNTIL YOU REMOVE THE THINGS THAT DO NO RESONATE WITH IT! WE SAY ALL OF THIS IN THE HIGHEST LOVE, BUT IF WE DO NOT SAY IT, YOU WILL NOT BE TRIGGERED TO WAKE UP AND TAKE ACTION! LET YOUR SPIRIT BE FREE LOVED ONE! YOU ARE THE MOST MAGNIFICENT BEING IN ALL OF CREATION SO COME AND MEET THIS GRAND CELESTIAL BEING! SEE OUR AMAZING RAINBOW LIGHT-BODY SHIPS IN THE CLOUDS! WE CAME TO WATCH YOU ASCEND AND TO HELP YOU WITH IT ALL! WATCH AS WE RING THE EARTH’S IONOSPHERE LIKE A BELL WITH GAMMA LIGHT BEAMS TO ASSIST YOU! WATCH SOMETHING SO AMAZING HAPPEN ON THE FIRST DAY OF SPRING! WATCH AS THE EARTH BECOMES FREE! AMAZING THINGS ARE HAPPENING ALL AROUND YOU DEAR ONE IF YOU JUST TUNE IN AND SEE! WHEN WILL THE EVENT HAPPEN? THE EVENT IS ALREADY HAPPENING! IT KICKED INTO HIGH GEAR STARTING ON 11-11-2018 AND WILL RISE TO AN APEX NEAR THE SPRING EQUINOX 2019! WHEN WILL THE OLD MATRIX BE DISSOLVED? WHEN I LOOK OUT AT THE WORLD, IT SEEMS AS THOUGH NOTHING HAS CHANGED! WE TELL YOU, IT ALREADY IS BEING DISSOLVED! EARTH ALLIANCE INSIDER MEMBERS AND PLEIADIAN DELTA FORCES ARE WORKING AROUND THE CLOCK TO PHASE THE 3D-MATRIX OUT AND PHASE IN A NEW 5D EARTH! WHAT ABOUT THE OLD WORLD DEBT-BASED ECONOMY? IT ALREADY CRASHED AT THE END OF 2018! DO YOU BELIEVE WHAT YOU HEAR AND SEE OUT THERE? MAKE SURE! WE SEE EVERYTHING FROM A HIGHER VIEW, REMEMBER? THE GRAND SOLAR FLASH IS ALSO UNDERWAY! ITS BEEN HAPPENING FOR 3 MONTHS NOW AND IT’S NOT JUST A QUICK ONE-MINUTE OR ONE-HOUR EVENT! IT IS BEST TO THINK OF IT AS A SERIES OF PLASMA WAVES INSTEAD OF A FLASH. MANY OF US ARE HAVING WHAT IS KNOWN AS ‘THE WHITE LIGHT’ EXPERIENCE! THE GRAND SOLAR FLASH ORIGINATES FROM THE CENTRAL SUN AT THE GALACTIC CORE! LIGHT FORCES ARE CHARGING UP THE EARTH’S SUN AS WE SPEAK LIKE A SUPER CAPACITOR UNTIL IT FULLY DISCHARGES. THE APEX OF THIS SERIES OF LIGHT WAVES WILL CULMINATE ON 3/21 AND COULD BE DESCRIBED AS GRAND FLASH OF WHITE MAGNETIC IONIZED PLASMA LIGHT! THINK OF THIS WHOLE PROCESS AS A GALACTIC-SIZED SUPER CAPACITOR CHARGING AND RELEASING! THIS IS EXACTLY WHAT STAR FORCES ARE DOING. THEY ARE CHARGING THE SUN AND THE NIBURU FLAGSHIP WITH SUPER PLASMA TO A MAXIMUM LEVEL AND WILL LET IT LOOSE WHEN THE CHARGE REACHES MAXIMUM EFFECTIVE LEVELS! ONE EXAMPLE OF THIS SOLAR-WAVE-FLASH WAS THE GAMMA WHITE-OUT ON 12:21! WHILE THIS WAS JUST A TEST, THE FINAL DISCHARGE WILL BE SIMILAR BUT WILL CAUSE A COMPLETE SUSTAINED 40 HERTZ GAMMA WHITE-OUT AROUND THE EARTH! THE GRAND FINAL DISCHARGE IS SET TO OCCUR AROUND THE EQUINOX ON 3/21! THIS GRAND OPERATION IS DUBBED “PROJECT ANDARA” AND WILL BE ONE OF THE MOST MAGNIFICENT TIMES EXPERIENCED ON EARTH! WHAT WILL HAPPEN WHEN THIS SOLAR FLASH IS COMPLETE IN ME? THE 3/21 MULTIDIMENSIONAL SOLAR FLASH APEX PORTAL WILL ALLOW SUPER HIGH VIBRATIONAL GAMMA-LIGHT-AKASHIC-DATA TO POUR INTO THE EARTH AND INTO YOUR AURIC FIELDS WHERE IT WILL BE CARRIED AT ONCE INTO YOUR DNA! YOUR CELLS WILL BE INSTANTLY RE-CODED TO A HIGHER ORDER AND YOUR LAYERED BODIES WILL BE ABLE TO PROCESS A MUCH MORE ADVANCED LEVEL OF COSMIC DATA CAUSING YOUR OUTWARD MATRIX REALITY TO MORPH INTO THE NEW EARTH/HEAVEN FREQUENCY! NOW LET US MAKE OUR FINAL PREPARATIONS GREAT ONES AS THE 3/21 5D PORTAL FULLY OPENS!